Rhea - Universe Galaxies And Stars Section. Rhea and Enceladus. Image credit: NASA/JPL/SSI. NASA's Cassini spacecraft captured this photograph of Saturn's Moon Rhea emerging from behind another of its moons, Enceladus. At 1,528 km (949 miles) across, Rhea is actually three times larger than Enceladus (505 km or 314 miles), but Cassini was much closer to Enceladus when it captured this occultation event on July 4, 2006. 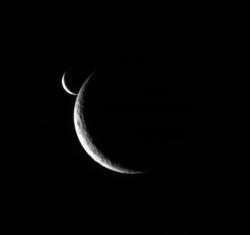 Two slim crescents smile toward the Cassini spacecraft following an occultation event. The image was taken in visible light with the Cassini spacecraft narrow-angle camera on July 4, 2006 at a distance of approximately 1.4 million kilometers (800,000 miles) from Rhea and 1.9 million kilometers (1.2 million miles) from Enceladus. The view was obtained at a Sun-moon-spacecraft, or phase, angle of about 142 degrees relative to both moons. Image scale is 8 kilometers (5 miles) per pixel on Rhea and 11 kilometers (7 miles) on Enceladus.